Heat oven to 400°F. Cut top off each apple; scoop out and discard core and seeds, using knife and spoon to hollow out each apple. In small bowl, mix pie filling and cinnamon. Spoon filling into each apple. Filling should be slightly mounded; do not overfill. 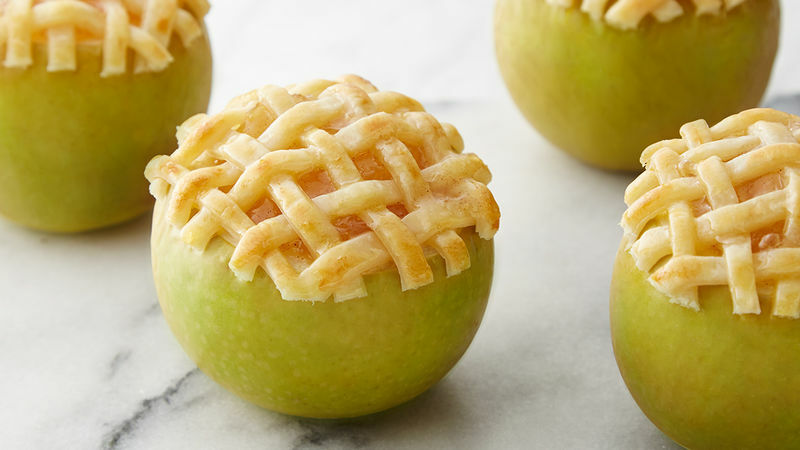 Unroll pie crust, and cut into fourths (one for each apple). Cut each piece of crust into 1/2-inch strips. Lay strips of dough on top of each apple. Alternate weaving of another dough strip over and under strips already in place. Repeat until top of each apple is covered. Trim excess pie crust around edges with knife. Place apples in ungreased 8-inch square (2-quart) baking dish; pour 1/4 inch water in baking dish around apples. Bake 28 to 32 minutes or until crust is golden brown. Let stand 10 minutes before serving. Large apples work best in this recipe. But since apples vary in size, just make sure to mound filling slightly; do not overfill. To make your own apple filling: In 10-inch nonstick skillet, melt 3 tablespoons butter over medium heat. Add 3 cups peeled, cored, chopped Granny Smith apples, 1/3 cup packed brown sugar and 1/2 teaspoon ground cinnamon. Cook 8 to 10 minutes, stirring frequently, until apples are tender. Continue with recipe as directed.